A BRITISH mother is making a desperate High Court plea to quash a repatriation order forcing her to live near an abusive ex-boyfriend in Spain. 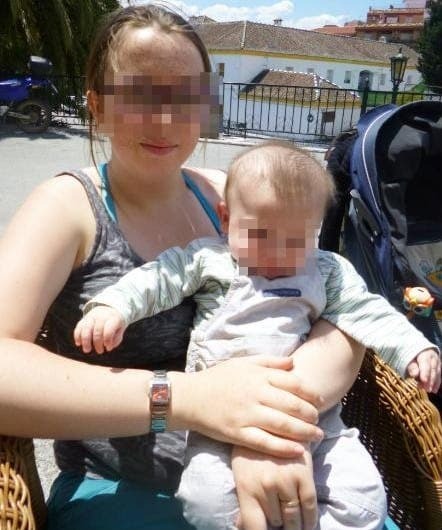 The 19-year-old told the Olive Press she is ‘frightened to death’ of her former Spanish partner, who was convicted of strangling her unconscious while pregnant. She is now appealing against a UK court ruling ordering her to live with her two-year-old son within 100km of her former abuser, who lives in the Alpujarras region of Granada. She has until June 1 to overturn the order, which is based on the Hague Convention. The ruling would see her forced to live near a man, who received a four-year prison sentence for a vicious assault on her in 2012. During the horrific attack she was kicked in the stomach twice and strangled until unconscious. “I am terrified of going back to Spain,” she revealed last night. “Justice is not the word to call this ruling. It is anything but just. The mother, who we are not naming for legal reasons, revealed that she had been suffering from stress and even fainted during the initial court hearing last month. Now a special High Court appeal hearing will examine a psychiatric report into her mental health today. She insists it is her ‘last hope’ of overturning the decision. Her sister meanwhile has also launched a change.org petition which has so far garnered nearly 1,000 names. The petition ‘Stop my sister and her baby being sent back to be beaten, or worse!’, addressed to UK Home Secretary Theresa May, has been backed by the family’s local Conservative MP and MEP. The woman, originally from London, fled back to the UK seven months ago after her partner allegedly acted aggressively towards their son. “He picked up their baby by the armpits and slammed him to the floor,” explains the woman’s mother, who has lived in the Alpujarras, in Orgiva, since 1999. The grandmother added that she had also been forced to file a denuncia after the man chased her down the street and threatened to kill her recently.